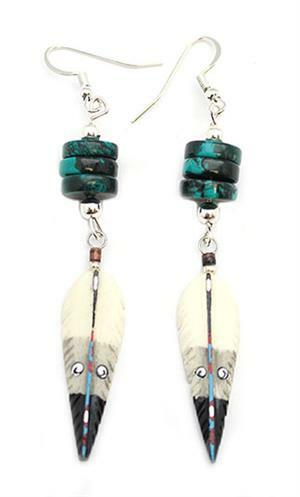 This earring consists of chinese turquoise discs, silver palted findings and a non indian imitation bone carved feather. It measures approximately 3 1/4" long including french wires by 1/2" wide at widest (feather). It is Navajo hand crafted by Sandra Francisco. Color shade of turquoise may vary and colors on feather may vary as well.